Indian traditional dance form Kathak managed to maintain its old glory even in this era where western dance forms are preferred most, due to the initiative taken by some young dancers like Sangeeta Majumder. 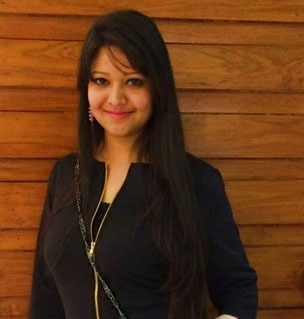 Sangeeta dedicated herself completely towards taking this art form into a new level. 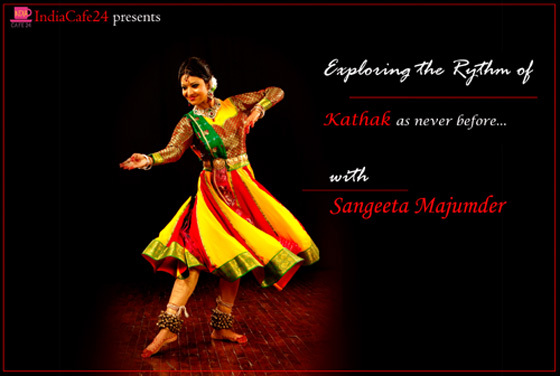 We had a quick session with her where she opened up heart to share her journey so far in the world of Kathak Dance. It’s a proud moment for Indiacafe24.com to have you with us Sangeeta. 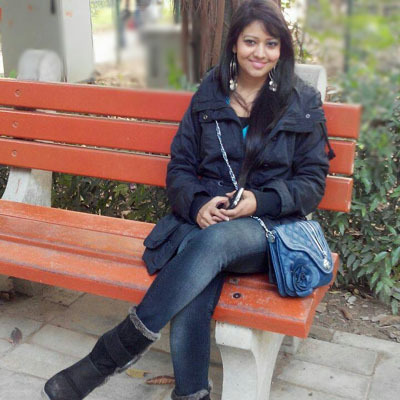 Sangeeta will request you to give a short intro about you, your family and your education? I was born in a business family in the City of Joy, Kolkata. I am the only child of my parents. My mother Shila Majumder is a singer and I consider her to be my best supporter since childhood. 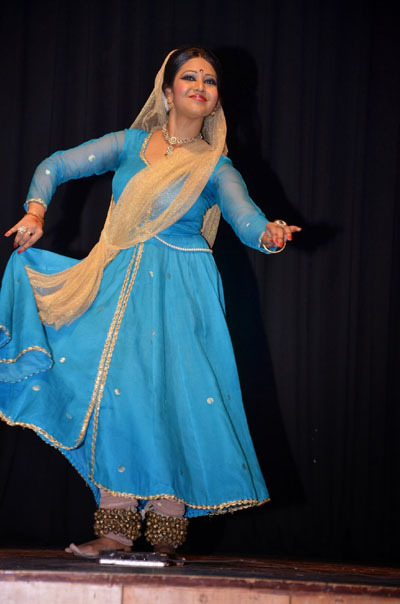 I did my Masters in Kathak Dance from Punjabi University, Patiala and Diploma with Distinction in ‘Kathak’ from Pracheen Kala Kendra, ‘Chandigarh University’. Apart from my musical qualifications I have done my Masters in English from ‘University of Calcutta’. You are well known Kathak dancer- What exactly is the reason which provoked you to pursue a career in dance? I can still recall that day – the very first day of attending the dance class. My mum tells I was two and half years old then. That was the beginning .Till few years back I never had any plan to pursue dance as my career. During this period I started giving public performances. By grace of God, my dance performances have been well perceived by spectators. How can I move without mentioning the encouragement that I have got from my Guruji. Gradually I realised I should spend more and more time with dance. Thus, my passion turned into my profession. Establishing oneself in a creative field is not at all an easy task. What sort of barrier you faced to get this position in the creative world? I do not have any legacy in dance. I shifted to New Delhi from Kolkata to learn this form rigorously. During this period I used to work in a school which became a time constraint for my practice. Taking dance lessons from my guru ji was not an easy task. Being a reputed performer he used to travel a lot. Moreover getting a stage in early days was quite a big challenge. Despite all these I have never compromised with my dance form and I have tried to maintain the purity of it. I believe, ultimately my commitment and honesty paid off. Why Kathak Dance and why not any other form of traditional Indian dance? It seems to be very funny and childlike to most of the people. ‘Pakeeza’ is one of my favourite movies. “Thaare rahiyo o bakein yaar.”- The dance steps, expression…That bol “ Dhatite Dhatite Dha Dha tite Kitdha tite, Dhan Dhan Dha, Dha Dha tite, Dhan Dhan Dha, Dha Dha tite, Dhan Dhan Dha”, the costume, the set—all these left an everlasting expression on my adolescent mind. All this have drawn me towards Kathak in my early days. Later, when I was learning all the dance forms along with kathak I discovered the natural movements of Kathak were going well with me. Thus I started flowing with this form. Who is the one who inspired you to establish a career with Kathak dance form? It’s not any particular person but many senior performers from different schools. They all are my source of inspiration. Majorly, my audience encouraged me to pursue kathak. What you feel what percentage of young generation still prefer to go for traditional dance form in place of western dance form? Who are your gurus who trained you and helped you to come out with flying colours in dance world? Pandit Ramohan Maharaj- basic and core of kathak and Pandit Deepak Maharaj for the Performance techniques. They both have trained me very affectionately. When you decided to pursue a career in dance how you parents and family reacted? My family did not realize when I actually entered this field. Now, they are happy to see my dance and my social activities. Say something about ‘STRINGS N STEPS’. I felt responsible as an artist of the society which accelerated me to an endeavour ‘STRINGS N STEPS’. This is an NGO, registered under society act, situated in New Delhi, India. This is a cultural group which promotes and teaches the children (from the grass root level of the society) music and dance and makes them aware of Art, Culture & strong heritage of India. I organise ‘STRINGS N STEPS FESTIVAL’ in New Delhi every year. This gives a platform to the little budding artists to perform with the established stars from Indian Classical field. It has another important aspect which is an exclusive venture presenting ‘Kathak’ and ‘Hawaiian guitar’ simultaneously on the same stage complementing each other. This is an amalgamation of Hindustani Classical dance supplemented by Western instrument playing Hindustani Raga by famous musician of India Shri Neel Ranjan Mukherjee (prime disciple of legendary Sitar maestro Padmabhushan Pandit Debu Chaudhuri), and Internationally acclaimed Tabla Wizard Ustad Akram Khan, supported by other instruments played by the musicians of international repute. Please share info about your achievements and awards in Kathak dance? In the vast ocean of Kathak I have just started sailing with my small boat. In this short tey exciting journey I did meet some recognition but I consider the appreciation from my audience as the best recognition till date. Once someone said “I want my new born baby to be a beautiful dancer like you and want to christen her with your name. “ This is the best complement I have ever had. But official felicitation and awards do matter a lot in terms of encouragement. This year I have been awarded with “Roll Of Honour” from Government college for girls, Punjabi University, Patiala by the education minister and have received ‘Uttar Pradesh Sangeet Natak Academy Award’ for holding the first position in Kathak competition. I’m really honoured to be felicitated by Padma Bhushan awardee Pandit Birju Maharaj in my Graduation Ceremony from Kalashram for securing Second position. The title ‘Nritya Gaurav’ , ‘Pride of Kolkata’, by Award Council of India, and many more like this. Also, the Felicitation by Padma Bhushan awadee Pandit Debu Chaudhuri in Ustad Mushtaq Ali Khan Festival is still a huge honour for me. Being interviewed in “National Channel of India Doordarshan” and “All India Radio” as a prominent Kathak danseuse in such a small span of time, is also quite encouraging. Being invited for giving solo performance and Strings N Steps performance in different cities of India and abroad widen path of my career. I am teaching in my own institute ‘Kalasangam’ Kolkata, ‘UMAK centre for Performing Arts’, New Delhi, Online and Offline class from our organisation, ‘Strings N Steps’, Every year I conduct workshop for Sahitya Kala Parishad, Cultural wing of Govt. of New Delhi in different schools. I am the visiting faculty of Kathak in Saaz-O-Awaz, Academy of Indian Music, Toronto, Canada. This year I have been invited to Buenos Aires, Argentina to conduct workshops and give performances. I am also fortunate to be invited to perform and represent India as Cultural Ambassador in India-Maldives Friendship Festival, in Male, Maldives. What’s the future of traditional dance forms in coming time? The future of the classical dance forms is very bright only if we demystify few things. Guru-Shishya parampara, gurukul, samavartan these are obsolete nowadays. I do believe that teachers of Classical Music and Dance should make the new students feel comfortable. In one word teaching should be Student – centric. And one more thing students should be given chance to perform from the very early time as this is a performing art form. I strongly believe that stage experience is the best teacher. What are your other passions in life apart from dance? My passion is of course, dance. But I also like painting, singing, hopping different Shopping Malls, Reading poetry by the all Romantics and of course by Rabindranath Tagore. My most favourite literary work by him is ‘Shesher Kabita’-‘Farewell Song’. What sort of initiative you are planning to take to maintain the interest and attraction of Kathak dance worldwide? Nowadays online teaching is a popular method to reach many people worldwide. Presenting Kathak to a wider audience by doing some experimentation within the tradition is always appreciable. In ‘Strings N Steps’, we use unconventional western instrument which amalgamates the traditional Kathak. Perhaps we are the first group from India collaborating Hawaiian guitar and Kathak dance. This helps us to interact with the global audience more convincingly. Who is you role model? Rukmini Devi Arundale. She was not only a great dancer and choreographer but an activist for Animal Rights and Wefare. An artist should be the virtuous soul who is dedicated to cultivate the new life in the field of music, dance and society. In one line Describe Sangeeta Majumder……………………..I am like water , free flowing, transparent, can take any shape according to the situation. Any advice and suggestion for budding dancers of India? If you have passion for dance, go for it. Do not compromise with your general education. Knowledge sharpens intellect which in turn gets reflected in your dance performance. 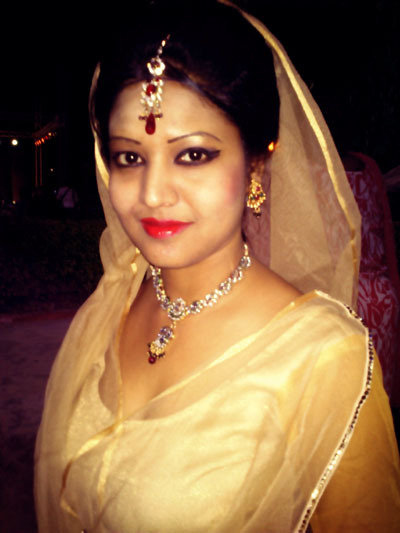 Wow your truly a pride of Kolkata ,, very well done (Y).. Keep up the good work :)..
You look gorgeous! Beautiful soul too. God bless! Really nice to know that at a time when every one seems to be influenced by western dances and dance forms, someone is taking up Kathak with such pride and passion. You deserve all the attention coming your way and even more. You should never ever let go of this passion of yours. Great work! Sometimes our own light goes out and is relighted by a spark from another person. Appreciation can make a day, even change a life. Your good wish converted into words is all which is necessary. Thank you!